The Travels Of Le Randonneur: Living With The Electric Yamaha EC-03 6 Months On. 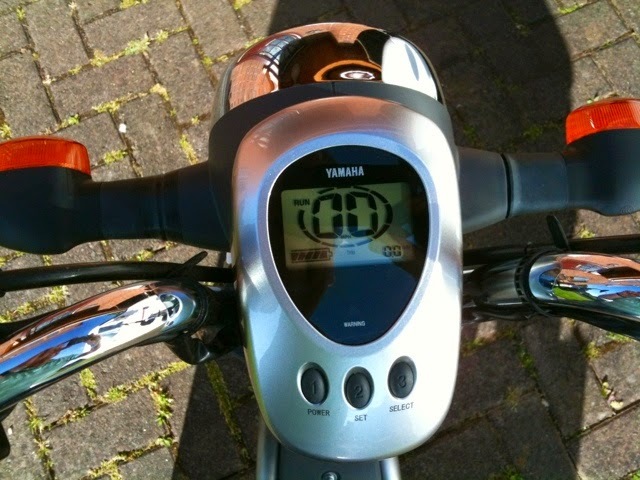 Living With The Electric Yamaha EC-03 6 Months On. 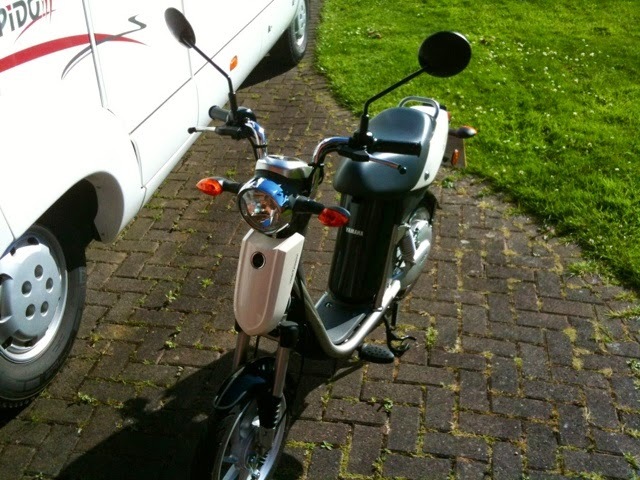 I bought the little electric Yamaha EC-03 as a vehicle to get to the shops on once on site and pitched in our motorhome. 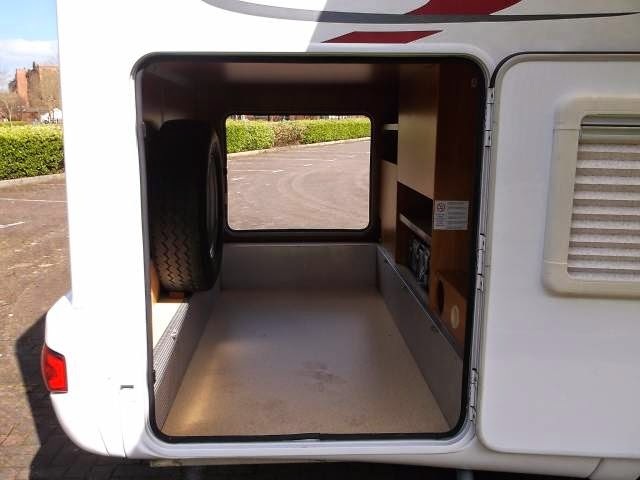 Our particular motorhome is a Rapido 963F, and has a huge rear "garage" storage area with access doors either side. 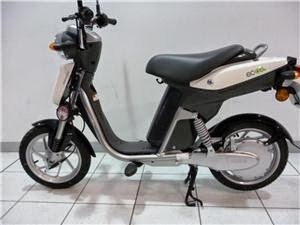 The space itself is ample to carry a small motor scooter, but the maximum gross weight rating of our particular vehicle is currently at the popular 3500 kg. This of course could be increased without further modifications to around 3840 kgs by submitting weighbridge data to one of the companies that specialize in this work, and obtaining a new rating plate and certificate which would be then submitted to DVLA for re-classification. This is all well and good, but that would then negate our son and his young family from using the vehicle due to the nature of his own driving license. Having passed his car driving test after 1998, he is only allowed to drive vehicles up to a maximum gross weight of 3500 kg without taking a further driving test. The gross weight also has implications for drivers over 70 years of age, (10 years to get there if I make it that far). Taking weight restrictions into consideration, the little Yamaha seemed to be ideal at only 56 kg, and also the fact that the bike carries no liquids, volatile or otherwise. The manufacturer claims a range of 43 km (26.7 miles) at 30 km/hr (18.6 mph). This will obviously vary with rider weight, road and wind conditions and temperature. 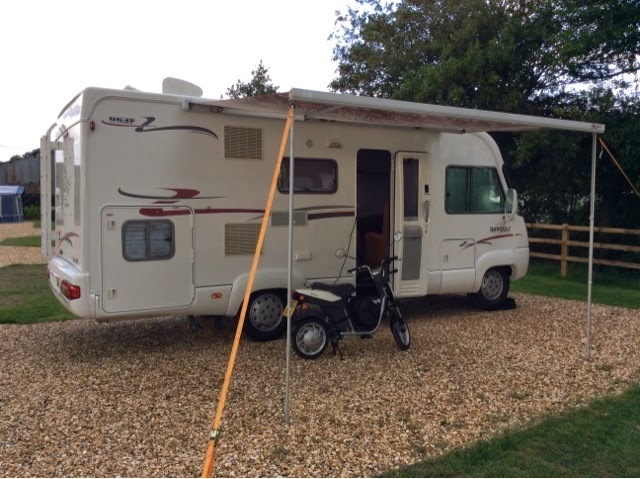 I have been using this bike now for approaching 6 months from the motorhome while we have been on various sites throughout the UK. It is pleasant to ride, if terribly slow. 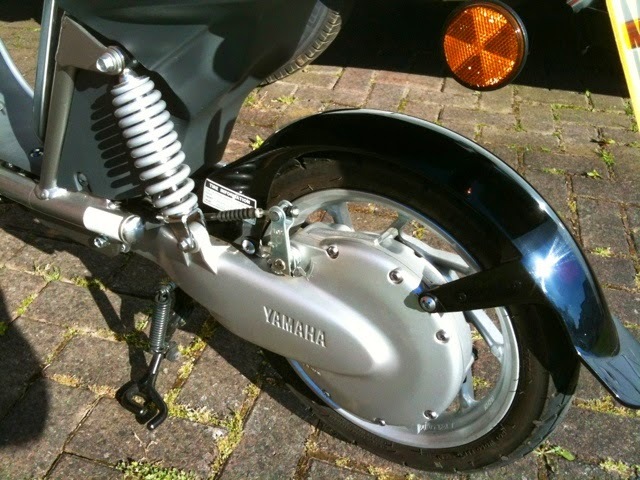 (Until quite recently I owned a Yamaha R1 1000cc sports motorcycle). I use it on a mixture of the two power settings, which are easily changed at the push of a button on the headlamp console. It would be ideal if it could be used on its highest setting permanently, but I have found that this reduces the range to between 12 and 15 miles between fully charged down to one battery indicator. If used wholly in the lower power setting this gives me a maximum speed of no more than 17 mph, slowing even further on gradients. This is where I use the power setting to increase to full, just to give it that extra boost, and this is where I would say, in my opinion, the bike is slightly dangerous. It can be as slow as a pedal cycle, but other drivers, seeing the registration plate and a rider wearing a motorcycle safety helmet, don't expect that, and become frustrated when stuck behind in traffic. A bus overtook me today using the wrong side of a "keep left" traffic island in the centre of the road. Used mainly in low power mode (when safe to do so), with bursts of full power when needed, my own range findings are around 15 to 20 miles, from fully charged down to one battery indicator. This of course is significantly less than the claimed 43 km. A warning light and beeper come on when actual speed exceeds 27 mph, which I presume is a nod to the 50cc petrol moped construction legislation that the bike is built to comply with. 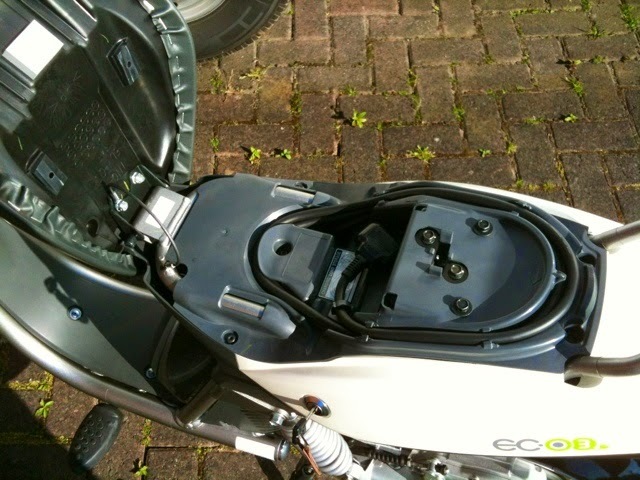 What I have now done is installed a cree LED H4 fitting motorcycle headlight bulb. I don't use the little bike in the dark, and this type of bulb, used in the housing designed for a halogen bulb doesn't give a beam, so is only good as a daytime safety running light, and would not pass an MOT for use in darkness. Being rated at 8 watts though instead of the 35 watts of the halogen bulb provided in the original specification, it increases the range of the bike by around 25%. I also use an LED stop/tail bulb for the same reason. Am I pleased with my purchase? Yes and No. 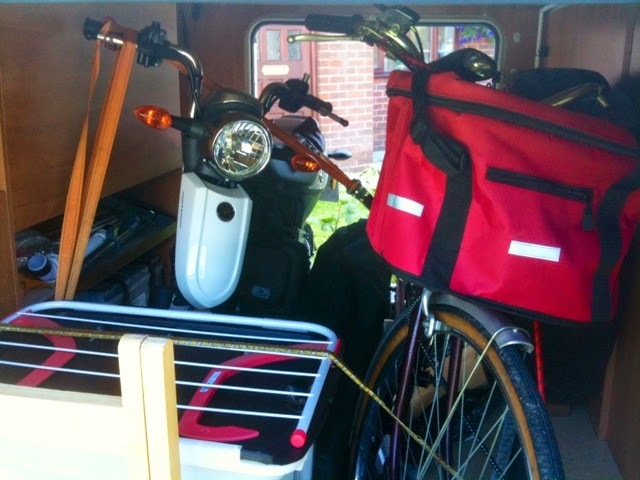 The bike is ideal for motorhome or caravan use, and is light enough to be carted around in this manner. However, for use as a serious mode of transport, I think the technology still has some way to go. 30 mph with 100 mile range is what would sell it. Unfortunately this is still not possible with the technology available. 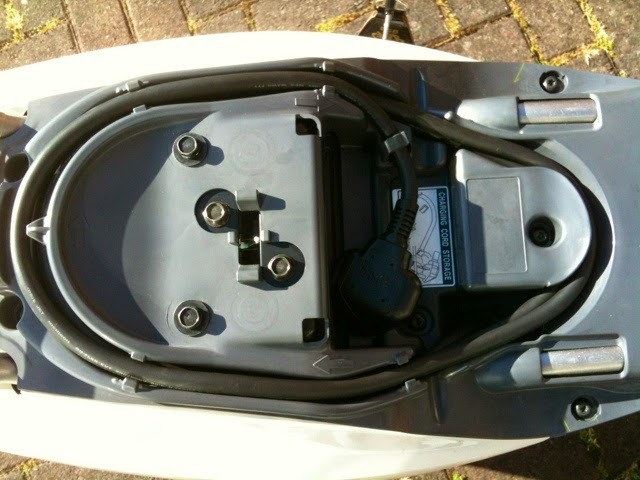 Even providing for an easily changeable battery so the rider could carry a spare if they wanted to would have been a better, if expensive solution to the range issue in my opinion. With hindsight, I would have been better off buying the excellent little Yamaha D'elight. This is light enough to carry (just, in my case at sub-100 kg) and would provide the ability of limited two up touring from the caravan site once pitched. The only problem there is that management refuses to ride pillion with me - lingering memories of that R1. 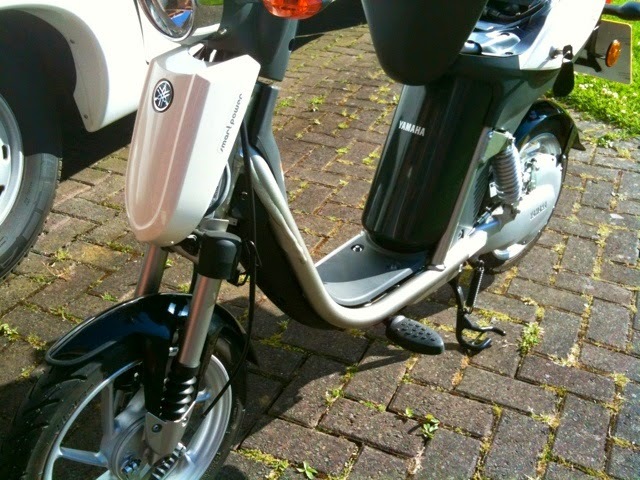 "I would have been better off buying the excellent little Yamaha D'elight" or even a pukka electric bicycle?? Having now gained experience of the EC-03 my opinion is that a good electric pedal cycle would be a much better bet. 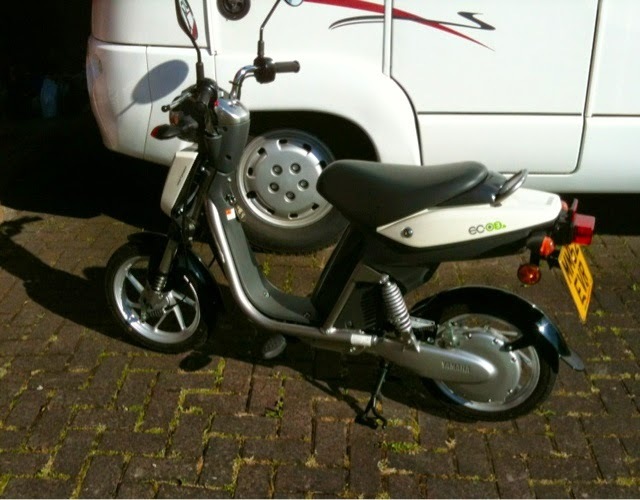 I have however gone one stage further now and bought the Delight 4-stroke petrol scooter ready for next season. Alcazaba Almeria - Moorish Fort. Lunch With Bombo And Sammy. A Day Out To Mojacar. An Al Fresco Birthday Party In Spain. Playa De Cabo De Gata. No More UK TV Reception In Southern Spain?